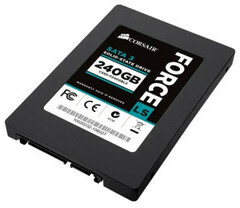 Corsair introduced the first three models from its Force LS Series of entry-level SSDs. These drives are Corsair's first ones to use the Phison SATA 6 Gbps controller and are available in 60 GB, 120 GB and 240 GB. The new Corsair Force LS Series SSDs have been announced earlier this week, thus becoming the first Corsair SSDs to be powered by the Phison SATA 6 Gb/s controller. The rest of Corsair's Force family consists of the following series: Force 3, Force GT and Force GS series, all featuring the popular LSI Sandforce SF-2200 controller. The Corsair Force LS SSDs are backed by a 3 year warranty with prices/capacities as follows: $69.99/ 60 GB, $109.99/ 120 GB and $199.99/ 240 GB. All these models would make excellent upgrades for older PCs or notebooks and they will available for purchase soon.